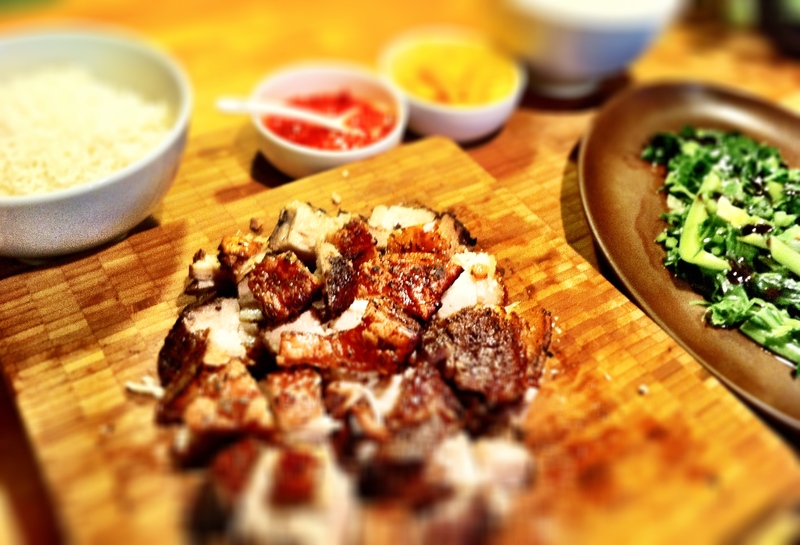 This spice rub makes enough to marinate up to a 2 kilogram side of pork belly. 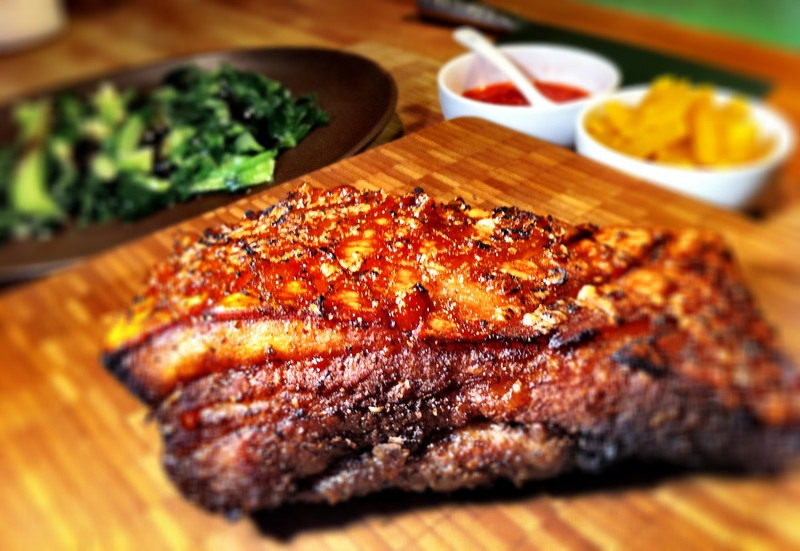 The rub works best if you prepare the pork a day in advance and allow the spice rub to marinate for 12-24 hours. You’ll need a roasting tray that has a roasting rack as the pork needs to cook in the oven over a bath. Toast all the herbs and spices in a dry frying pan for a couple of minutes or until they start to smoke and you can smell the spices release their fragrance. Grind well in a mortar and pestle or food processor and then mix the salt and sugar into the spice mix. If your pork belly skin isn’t scored, puncture the skin deeply with a skewer, without cutting the meat, as many times as possible. Boil a kettle of water and pour it over the skin. This will cause the skin to shrink slightly. 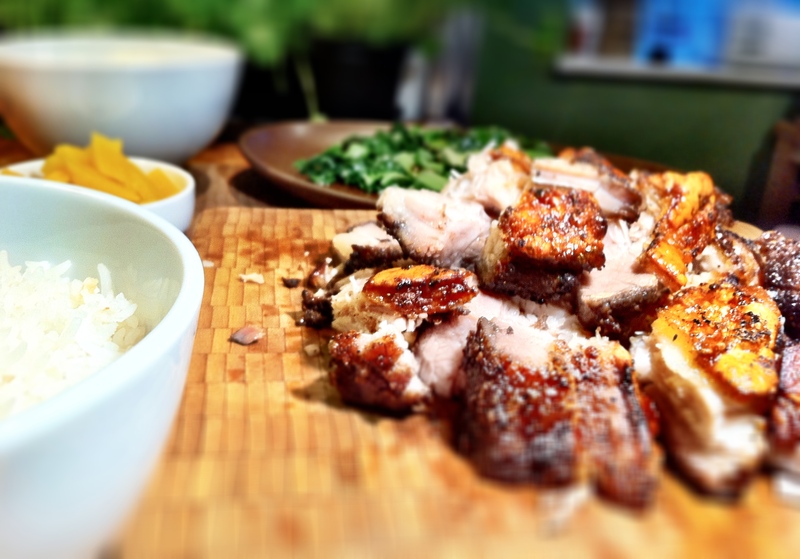 Don’t worry about the sides of the pork meat going white and cooking slightly. Dry the pork off and turn it meat-side up. Rub your spice mix into the meat (don’t marinate the skin) and try and ensure you get it into every nook and cranny. flip the pork back ski-side up and cover with tin foil and leave overnight in the fridge. Leave a little opening in the foil because you want the skin to dry as much as possible. Straight out of the oven and ready to go under the knife! Preheat the oven to 200 degrees celsius. Place the pork on the roasting rack (skin side up) and fill the roasting tray with boiling water (making sure the water never touches the pork or rack). Sprinkle the skin liberally with some more Maldon sea salt. Place the pork in the oven on the highest rack possible and cook at 200 degrees for 25-30minutes. Then turn the heat down to 180 degrees and roast for 1.5 to 2 hours hours. You’ll need to check on the pork at least once or twice to make sure that there’s always water in the roasting tray. When you take the pork out of the oven, leave it to sit for 10 minutes and then cut into chucks. 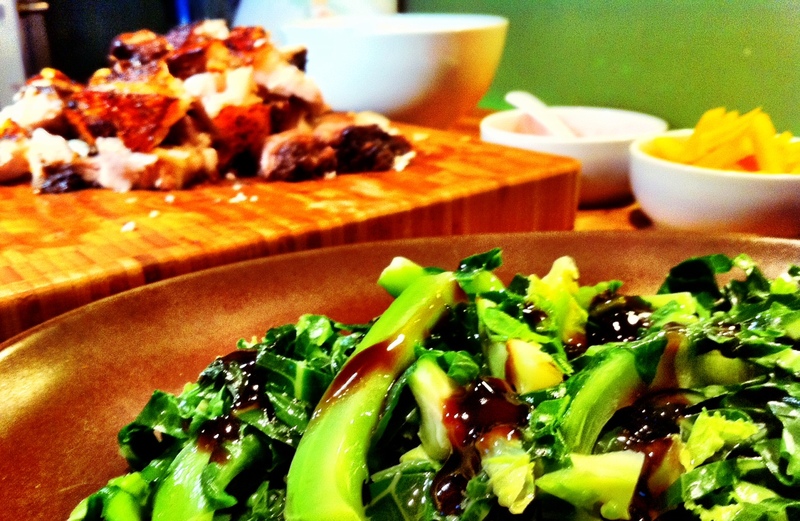 Try not to devour too much of the crackling before you even serve it! It’s best served with plain white rice and steamed green vegetables just dressed with a bit of sesame oil and oyster sauce. This is my kind of Sunday roast!